Congress cites Ajit Doval’s 2010 interview, says he gave ‘clean chit’ to JeM chief. The Congress on Tuesday cited a 2010 interview of National Security Adviser Ajit Doval to claim that he blamed the BJP-led government for the release of JeM chief Masood Azhar in the Kandahar hijacking episode and gave a “clean chit” to the terrorist. The scathing attack by the Congress comes a day after the BJP latched on to Rahul Gandhi’s reference to the Jaish-e-Mohammad chief as “Masood Azhar ji”. The opposition party had hit back, accusing its rival of deliberately twisting Gandhi’s comments made sarcastically. “Modi government’s NSA, Ajit Doval, ‘spills the beans’ and indicts BJP government in release of terrorist, Masood Azhar. Doval said (in the interview), ‘Releasing Masood Azhar was a political decision’,” Congress chief spokesperson Randeep Surjewala tweeted. “Will Prime Minister Narendra Modi and Union minister Ravi Shankar Prasad admit to the anti-national act now,” he said in a series of tweets using the hashtag ‘BJP Loves Terrorists’. Surjewala also attached a link of Doval’s 2010 interview with the tweets. 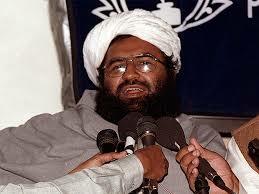 “Modi government’s NSA, Ajit Doval’s ‘clean chit certificate’ to terrorist, Masood Azhar revealed,” he said. “1. Masood doesn’t know how to fabricate an IED. 2. Masood is not a marksman. 3. After releasing Masood, tourism in J&K has gone up by 200%,” Surjewala quoted Doval as saying in the interview. Doval saluted the real “nationalistic policy of Congress-UPA to tackle terror, the Congress spokesperson claimed. “UPA-Cong came with a categorical policy on hijacking. No concession, no talks,” he quoted Doval as saying. Why the BJP government did not show the same guts, Surjewala asked. He asserted that it was Azhar who was responsible for the killing of 40 CRPF soldiers in Pulwama in Kashmir on February 14. Azhar and two other terrorists, Mushtaq Ahmed Zargar and Ahmed Omar Saeed Sheikh, were released from Indian prison in 1999 by the then BJP-led government headed by Atal Bihari Vajpayee in exchange for the passengers held hostage on board IC-814 flight hijacked to Kandahar in Afghanistan. Azhar formed the Pakistan-based terror group JeM after his release from jail. Since then, the group has been involved in terrorist attacks in India. The group was responsible for the attack on Indian Parliament on December 13, 2001 in which nine security personnel and officials were killed. On January 2, 2016, a heavily armed group of JeM attacked the Pathankot air base in which seven security personnel were killed. JeM also carried out the attack on Uri brigade headquarters on September 18, 2016, killing 17 soldiers and injuring 30 others. And the latest is the Pulwama attack.